I was actually surprised by how much I liked this book! I read it for the April readathon and finished it pretty quickly. Glad you liked it too! I was also pleasantly surprised! I have been told this is an Asheley book. Opinion, please? I really liked this book - and it's because it's all about DRAGONS. I love a good dragon book ;) I really should read the next book in this series!!! Ditto to the series! Let's make this happen. I really enjoyed this book too-one of my favorite first books even if the other two weren't quite as good IMO. And I love Will, so very much! I'm stoked to read them, regardless! And Will is charming, it's true. I was a little meh about the insta love - but still, I thought the sexual tension was fabulous anyway! Sophie Jordan is pretty awesome at writing the swoons. Team Cassian. Will is such a snooze. But DRAGONS, Lisa. Dragons. *hands to head* This one has been sitting on my Nook shelf for a year. You have shamed me greatly. I need to hurry up and read Hidden. Sigh. I like your review! 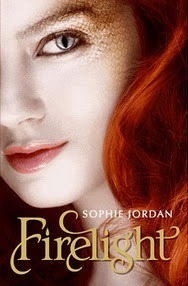 I read fire light and was so angry about so many things about the book... It was my very first angry 1 star review and I wasn't nice about any of it either. Yes, I could edit it... but then, it wouldn't be my true feelings. Does that make sense?